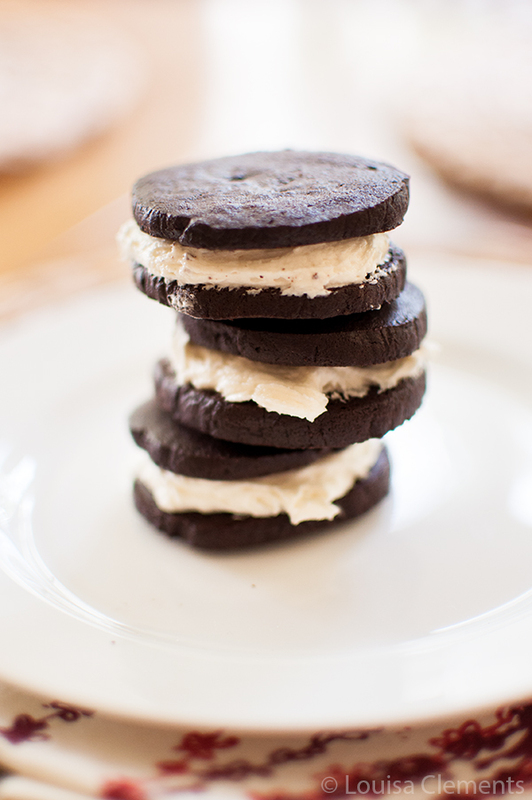 A simple recipe for homemade Oreo cookies! Make your childhood favourite at home with an intensely chocolatey cookie and sweet vanilla filling. (author of the blog of the same name) that I plan on giving to someone for Christmas. It’s quickly become a go-to cookbook in my kitchen, and by that I mean I can’t stop eating (or making) these homemade Oreo cookies. The book is broken up into chapters in a unique and quirky way, instead of your typical sections we find the chapters titled “flaky”, “crumbly” and “smudgy” to name a few. While at first I didn’t find this to be incredibly intuitive, it has made thumbing through the book to be quite fun. You never know what you are going to find! There is also a great index at the back making it easy to find your favourite recipes. I was pleasantly surprised to see that this cookbook included both savoury and sweet items, everything from a roasted butternut squash and sage tart to deep dark cherry and chipotle brownies. I know, isn’t your mouth water just thinking about them? One of my favourite sections of the book has to be the “demystifying pastry” section because I am completely terrified of pastry, having had some epic fails over the years. 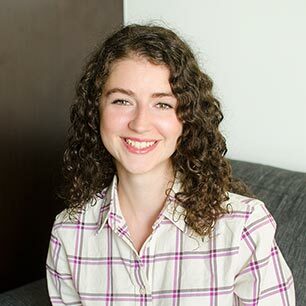 With Charmian’s warm voice, I’m now feeling more confident and equipped to tackle her “No-fail pastry”. The book is packed with amazing sounding recipes that it was difficult to choose which one I wanted to make. Of course, I opted for a childhood favourite, Charmian’s Double-Stuff Über-Oreo Cookies. Which are completely delicious and better than I ever thought possible. Whip up a batch of these this week, you won’t regret it. 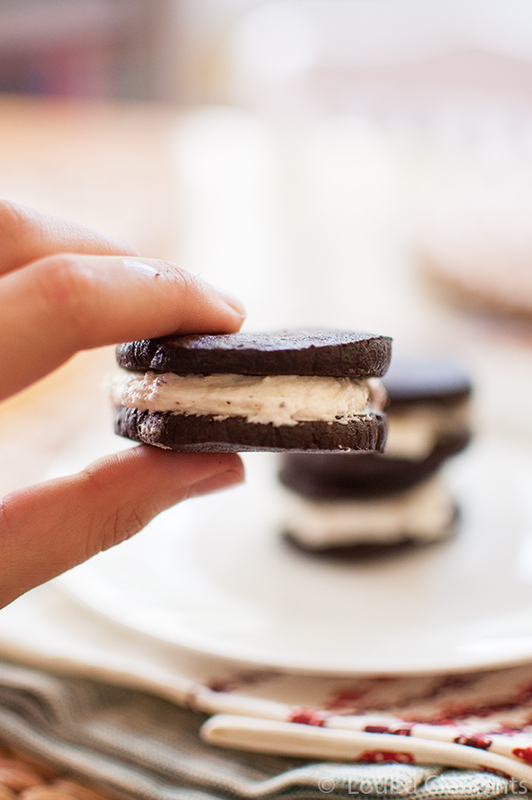 This “Oreo” cookie is actually a classic pâte sablée pastry loaded with cocoa and acting as bookends for a decadent buttercream icing. I knew I nailed the recipe when a friend bit into one and giggled. She’s not a giggler. Like the famous cookie that inspired it, this ultrarich chocolate treat with its double-thick middle pulls apart easily. While these cookies aren’t a grab-a-handful after-school snack screaming for a glass of milk, they do gently request a second helping. To make the cookies: Using an electric mixer or a stand mixer fitted with a paddle, beat the butter, confectioners’ sugar, and salt together until light and fluffy. Add the yolks and vanilla and beat until soft and light. Into a medium bowl, sift the flour and cocoa together. Using a large wooden spoon or the stand mixer on its lowest setting, blend the flour mixture into the butter mixture. When all of the flour mixture is incorporated, increase the speed to medium and beat to ensure the dough is well blended. Divide the dough in half and spoon onto plastic wrap. Form each half into a roll 10" long and approximately 2" wide. Make the rolls as round as you can. If you can’t make them uniformly round, make the rolls square. The aim is to be uniform, so pick the shape you can make best. Refrigerate for at least 2 hours or overnight. Alternatively, the raw dough can be frozen for a couple of months. When you’re ready to bake, preheat the oven to 325°F and line 2 baking sheets with parchment paper. Using a sharp, thin-bladed knife, slice the dough into scant 1?4"-thick rounds and place on the baking sheets about 1" apart. Bake for 15 to 18 minutes, or until the cookies are firm when touched in the middle. Cool on racks. To make the filling: While the cookies are baking, prepare the filling. Using an electric mixer or a stand mixer fitted with a whisk, beat the butter until smooth. Add the confectioners’ sugar, salt, and vanilla and beat on low speed to incorporate the sugar. When the sugar is fully absorbed, increase the speed and beat until the filling is very light. Keep beating. A bit more. This takes up to 5 minutes. You want the filling to be almost white. To assemble, place 1 tablespoon of filling on the bottom of a cooled cookie, place a second cookie on top (bottom against the filling), and gently press. Repeat with the remaining cookies and filling. Note: The cookies can be stored in an airtight container. Leftover filling can be frozen for the next time. Variations: Feel free to play with the filling. Make it orange, coffee, mint, or any other chocolate-friendly flavour you like. TIP: If you don’t have Dutch-processed cocoa powder, use regular and add 1/2 teaspoon baking soda. Disclaimer: I was sent a copy of The Messy Baker by HarperCollins to review, all opinions are my own. This post contains affiliate links, thank you for supporting Living Lou. 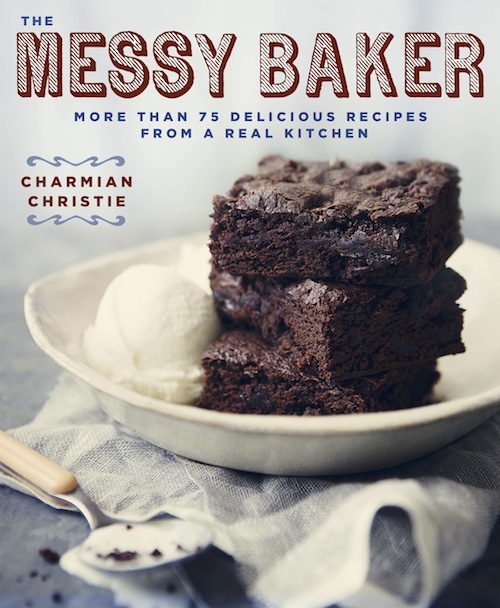 Recipe from The Messy Baker by Charmian Christie ©2014. Published by HarperCollins Canada. All rights reserved. Great review, Lou! I also collect and read cookbooks, and I'm always looking for a good baking book to add to my shelf. The layout of that cookbook sounds fun, I love thumbing through the pages and finding surprises galore. Also, those oreos look delectable! Those were always my favourite packaged treat so I'd love to try my hand at homemade ones. Thanks, Allison! You definitely need to pickup a copy of this book, it's not vegan but it would make a certainly make a pretty awesome Christmas gift for someone. I’m so glad you like the Oreos. They are addictive and disappear at parties very quickly. I only make them when I know company is coming because I don’t trust myself around them.Keep at that pastry. If I can learn it, anyone can. And this comes from the woman who use to botch pastry so badly it was an unrollable grey lump. Incredibly addictive, Charmian...what have you created! I'm bringing a bunch to school over the next couple of days, otherwise I'd eat them all. Oooh, these look so much better than the store-bought ones, and I love those ones. Pinned - must-try! Thanks, Anna! They are SO much better than store-bought, you can't even compare the flavour. I'm straight up obsessed with these cookies! I ate so many at the launch party! I mean, how could you not be obsessed with these ones, right!! Hi Valerie, no way I had no idea! I can see why, they are so good, you must try them! Have added you to the list, and am looking forward to checking out your post. Holy moly, how did I miss these when looking through the book!?! Oreo's are probably one of my favourite cookies, so you can bet I will be making these for either Thanksgiving or Christmas! Hi Britt, I don't know how you missed these but you need to make them for the holidays! They are sure to be a crowd favourite and are quite simple to make! I think they taste as good as they look on the picture. They sound absolutely delicious!!! Thanks, Olivia - they sure do! These sound delicious! Are these soft oreo type cookies or are the cookies a bit closer to the hard oreos sold in stores?Thanks! Thanks Nicole, these are very close (and even better) than the Oreos that are sold in the stores!